This evening started out with photographing a lightning storm over Grand Portage Bay. After the current round of storms had moved out over the lake I checked the radar and it showed more storms moving right towards Grand Marais. I figured it was a good chance to try and catch some lightning behind the lighthouse, so I hopped in the truck and headed for town. As I drove down the shore I started to see faint flashes of light out over Lake Superior and the further south I drove, the closer those flashes seemed to be. The conditions were looking good for capturing the photo that I had in mind! By the time I made it to Grand Marais, however, the storm that I had been watching all along the way had moved further out over the lake and was no longer a good candidate for lightning shots over the harbor. The clouds, however, were still beautiful and the moon was peeking in and out from behind them. I waited until the moon was out in the open to make this shot. The sailboats are lit from the stray light coming from the street lamps. 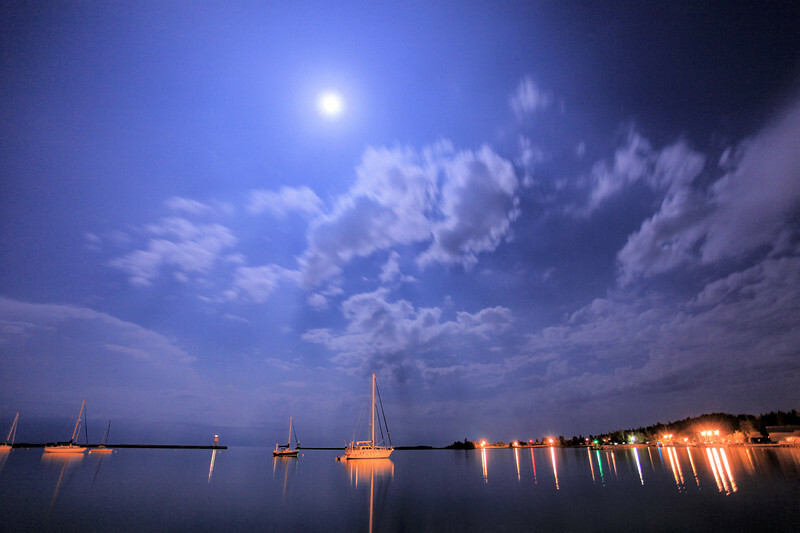 It sure was a sublime night on the harbor, not a ripple on the water despite the passing storms earlier in the night. 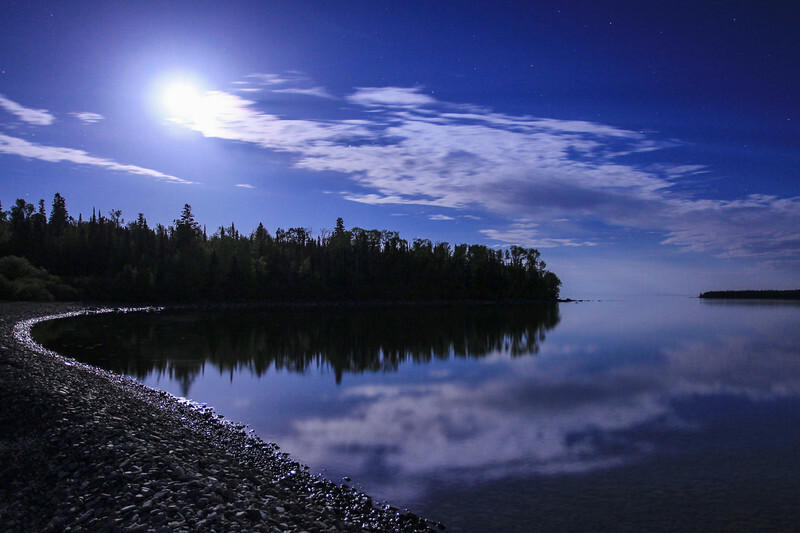 "May Moon over Pete's Island"
On the night that I made this image I hopped in my boat and motored out to the island that is directly in front of my house, hoping to capture some photos of the northern lights that were occurring that night. I did get a few shots of the lights, but my favorite photo of the night is the one you see here. I was not expecting to capture such a nice “moonscape” image on this outing! After photographing the aurora to the north, I turned around and saw the view that is shown here. I loved the way the moonlight was reflecting on the wet rocks along the water’s edge and the way those wet rocks draw your eye further into the scene. As I sat there enjoying the view I couldn’t help but think about the interesting history surrounding this island. Pete's Island (also known as Grand Portage Island) is the only island in Grand Portage Bay, the Lake Superior bay on which I live. This island is named after Pete Gagnon, who used to operate a store on the island in the days before a highway came up the shore, the days when the lake was the highway. Because Grand Portage Bay is such a shallow bay, when the steamer "America" used to deliver supplies up and down the shore from Duluth, MN to Thunder Bay, Ontario the only dock it could land at in Grand Portage Bay was the deep water dock on Pete's Island. To this day the cribs from the dock can still be seen a few feet underwater, extending out into the bay. The "America" provided service for 26 years along this route, until June 7, 1928 when she struck a reef in Washington Harbor on Isle Royale and sank. Today, the America is a popular dive site on Isle Royale, her bow resting only a few feet beneath the surface. This image is of the Pigeon River in northeast Minnesota, just downstream from Grand Portage State Park (which is where I work for my "day" job). The Pigeon, like many rivers, is a river of many moods. 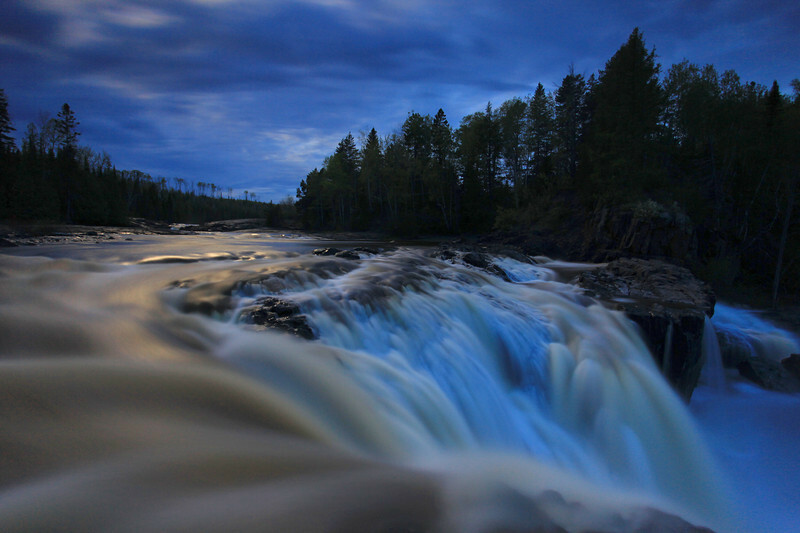 The majority of the river is characterized by very rugged terrain, with the water tumbling over boulders and through narrow gorges in rapids of varying intensity. Some areas, like the one pictured here, are very serene. The area shown in this image is only about a mile upstream from the mouth of the river. The Pigeon originates near the eastern edge of the Boundary Waters Canoe Area Wilderness. 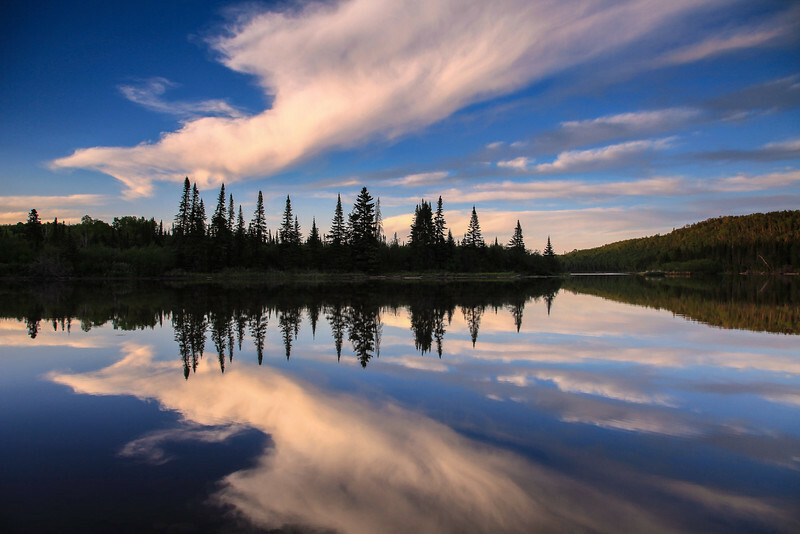 After the mostly violent and sometimes peaceful journey through the rugged valleys of northern Minnesota it empties very quietly and with little fanfare into Lake Superior. As mentioned earlier, this particular spot along the river is just downstream from the state park where I work. It is one of my favorite places along the river and I often stop here after work to see what the conditions are like. On the evening I made this image, I had already gone home for the day but as sunset approached I was very intrigued by the clouds that were lingering in the sky. I immediately thought of this place on the river and how calm the water usually is. Little did I know what an incredible sight I would find when I arrived! This is without a doubt the coolest cloud I have ever seen over this part of the river. 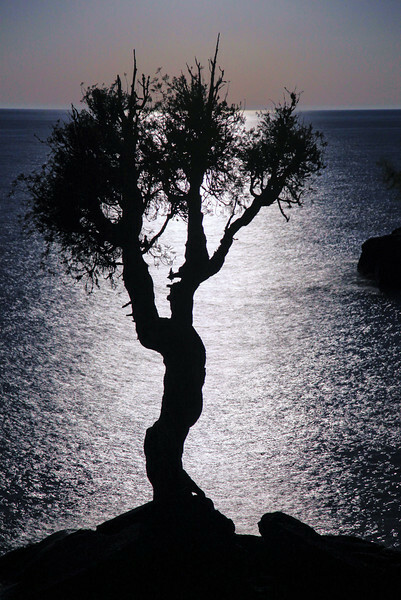 This image was made only moments after the sun went down behind me. The point of view shown here is actually looking east/northeast, but as often happens immediately after sunset the clouds took on quite a glow. My outing to the river resulted in an experience that I will never forget! 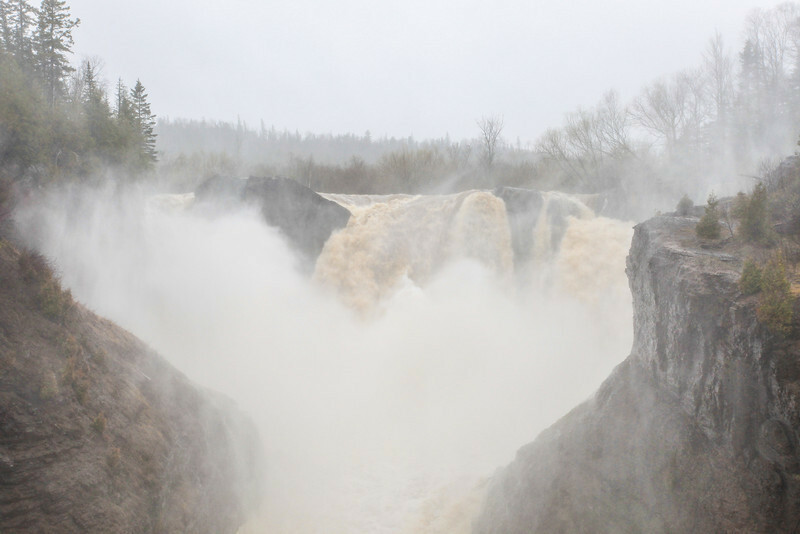 High Falls on the Pigeon River is RAGING right now! After 3+ inches of rain over the past 3 days the gauge height on the river is almost 10 feet. Never have I photographed the falls at such a high water level before. I've photographed it with a gauge height of 9 feet before, but never 10. It really is a challenge because there is SO much mist and spray coming off the falls it is almost impossible to get a shot off before your lens is covered in moisture. You literally have to have one finger on the shutter and use your other hand to wipe moisture from the lens. Immediately after you pull the cleaning cloth away from your lens, you need to fire off a shot and if you're lucky you'll get a photo without any water spots on the lens. I took quite a few shots of the falls, and each one was so different due to the different patterns in the spray shooting up from the base of the falls. 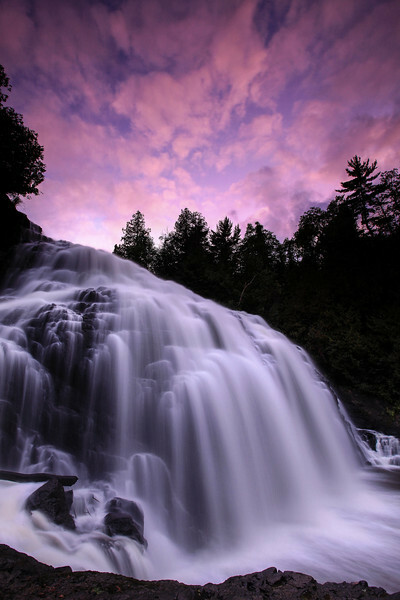 Keep in mind that this waterfall is about 120 feet tall and quite often the spray would shoot up beyond the top of the falls! 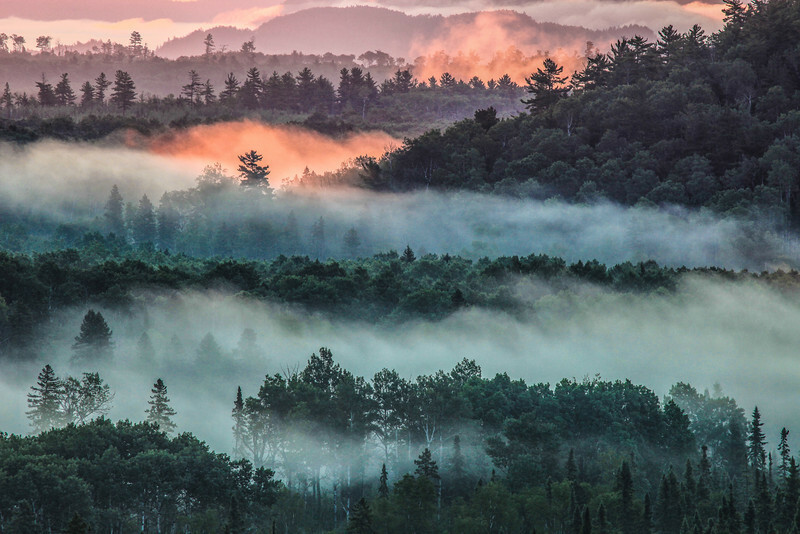 "First Light, Foggy Morning - Pigeon River Valley"
This photo was made after a night of photographing the northern lights along the Arrowhead Trail in northeast Minnesota. As I drove home via the back roads I noticed that there was quite a bit of fog in the Pigeon River valley below me. I pulled over at the Pigeon River Helipad Overlook along Otter Lake Road and waited for the sun to come up. I knew that once the sunlight started to hit the fog it would be an incredible view. Sure enough, as the fog started to glow from the light of the rising sun I was awestruck by the beauty and depth of the scene laid out before me. Can you say.... W O W !!!!!!!!!! ? 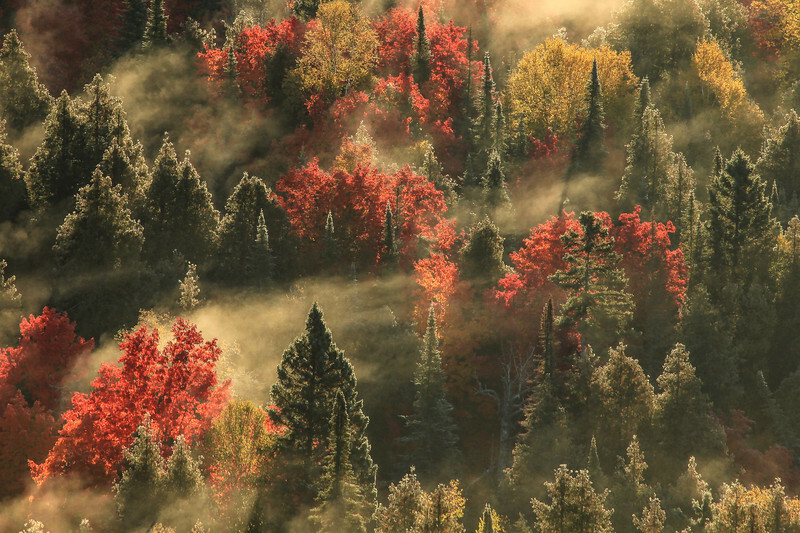 This was the scene I witnessed just moments after making the “First Light, Foggy Morning – Pigeon River Valley” photo. I had noticed the fog along the river earlier in the night and decided to come back to this location for sunrise. It proved to be a worthwhile decision. 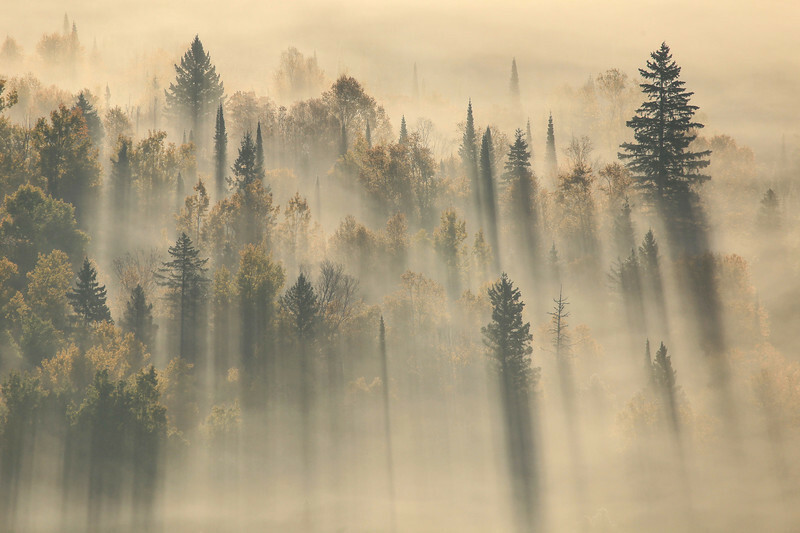 As the sun rose over the hills and the light hit the fog in the valley, the colors and layers between the fog and trees were breathtaking. I thought it was beautiful when the sunlight first started to hit the fog, but the best was yet to come as this picture shows! This morning we got up early to head inland and check out the fall colors and (hopefully) see some fog rising out of the valleys. Well, when it came to the fog, we hit the jackpot! 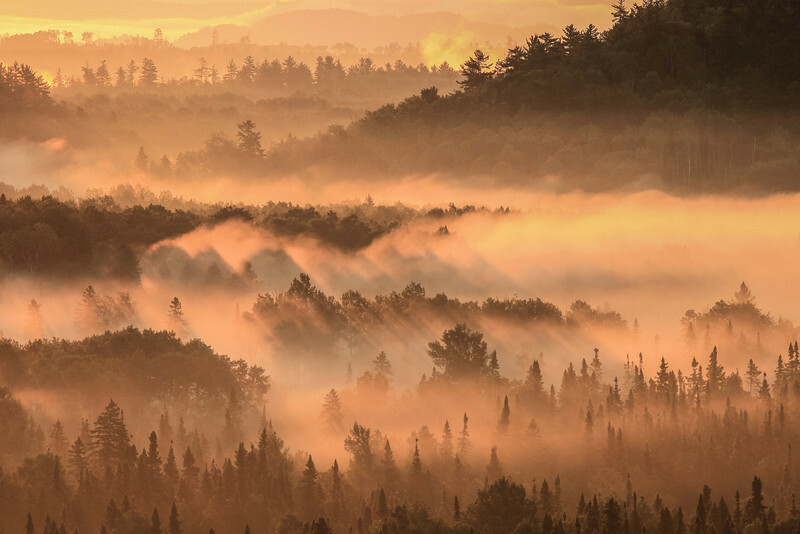 This morning gave us the best foggy views that I have ever seen in all my years of photographing early autumn sunrises in Grand Portage. The light and fog was constantly changing, presenting us with an incredible amount of variety in the view of the landscape laid out before us. This definitely ranks as one of the top mornings I've ever spent in the woods! This morning was amazing. I brought a couple of friends up into the woods to shoot the fall colors and we were treated to some pretty incredible conditions! 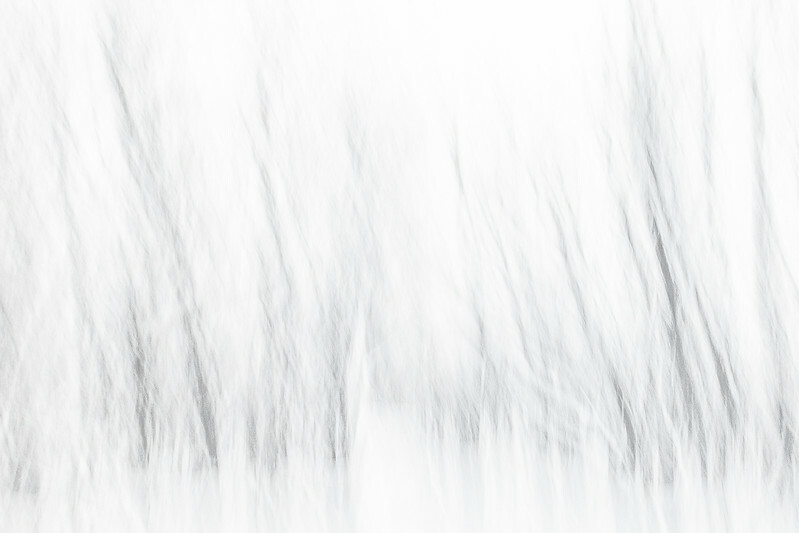 Thanks to the cold overnight temperatures and lack of wind, the forest was filled with fog and frost. To top it off, the leaf colors were magnificent. It all made for a little slice of photographic heaven! "We have TWO fish, one for each of you!" 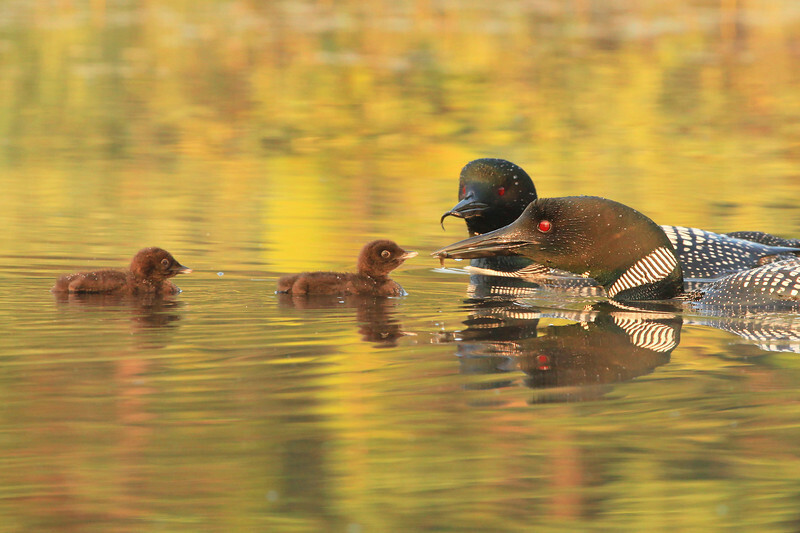 On Thursday, June 30, 2011 my friend Roger and I discovered a loon nest completely by accident on a local lake in Grand Portage. We were looking for turtles sunning on logs, which are a common sight on this lake. No turtles on that day, but while walking the shoreline we spotted a loon nest out in the tall grass across a narrow channel of water in a protected corner of the lake. 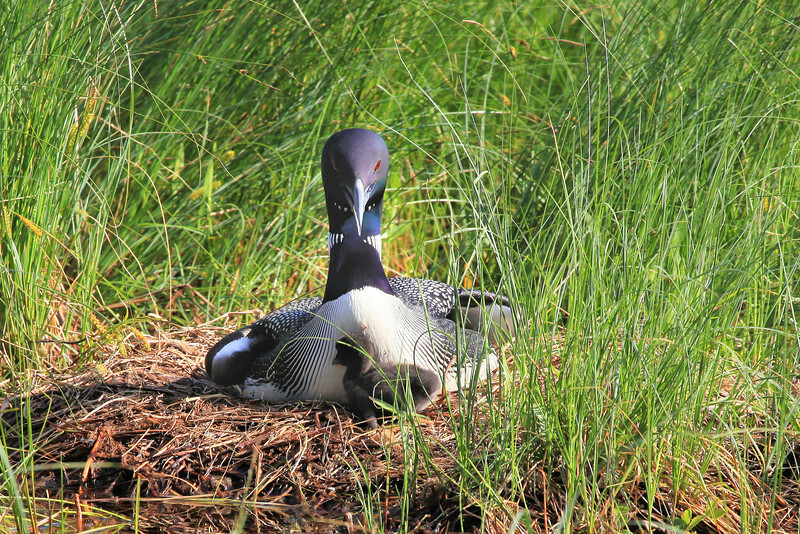 There was a loon sitting on the nest, which meant that there were eggs! Right then and there we made plans to come back in the morning and watch the nest all day in hopes that the chicks would hatch while we were there. We returned at 9:00 AM the next morning and saw the adult was still sitting on the eggs. This was the beginning of what would end up being a two-week stretch of daily checks of the nest. After a week of visiting the nest there was still no sign of the chicks. I was starting to get a little worried about the eggs and whether or not they would hatch, since most loon chicks are born before mid-July. Finally, when I visited the nest on the morning of July 14th, I noticed right away that one of the babies had been born and was hiding behind the adult on the nest. I watched the nest for part of that day and eventually got some shots of the baby in front of the adult on the nest. 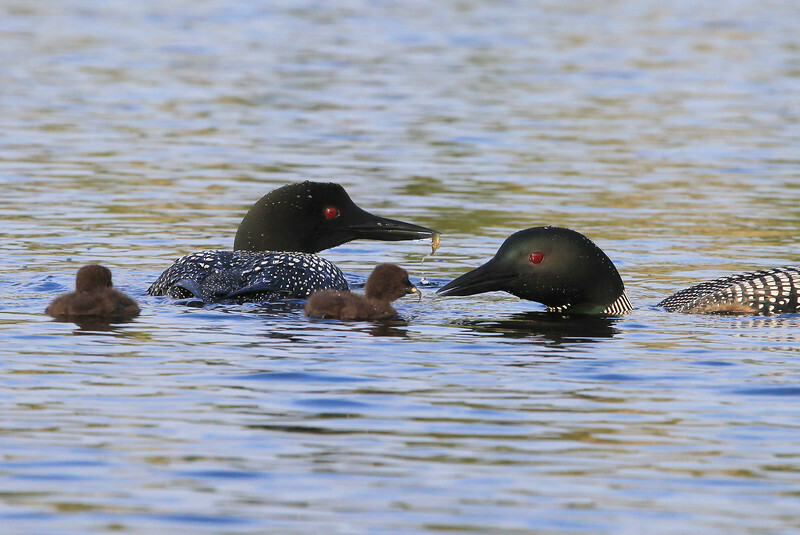 When I returned the next day the other baby had been born and the loon family was already off the nest and out in the middle of the lake. This was when things got really interesting! Since the 14th I haven't quite been making daily trips to the lake, but almost. Watching the adults interact with their chicks out on the lake has been one of the most amazing wildlife experiences I’ve ever had. The amount of care and attention that is given to the chicks by the adults is amazing. 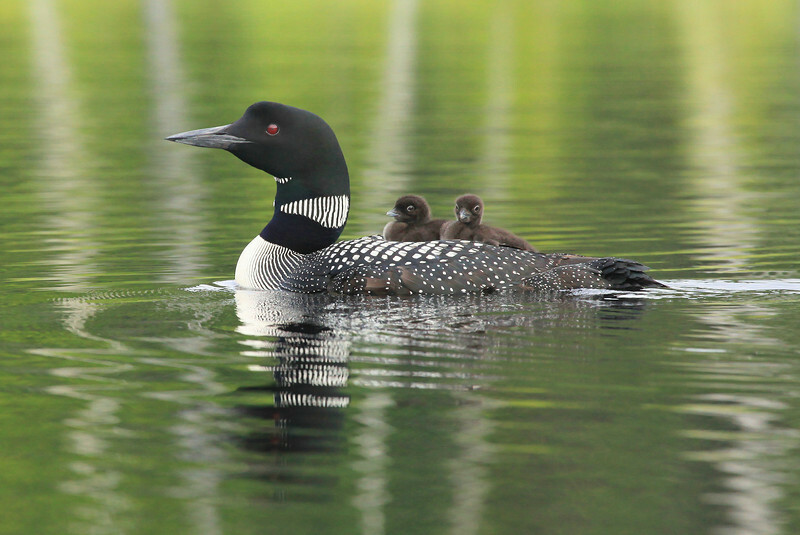 Most of the time during their first week of life the chicks ride on the backs of the parents. This is done mostly for protection from predators, but also because the chicks get tired easily and need to rest. At one to two weeks of age they are already diving on their own (although their dives only last for a few seconds), they are learning to preen themselves, and soon they will be catching their own food, which consists mostly of minnows (small fish). The images you see in this collage are the result of around 80 to 100 hours watching and photographing this family of loons. It took a lot of effort on my part to come away with these images, but I think the effort was well worth it! 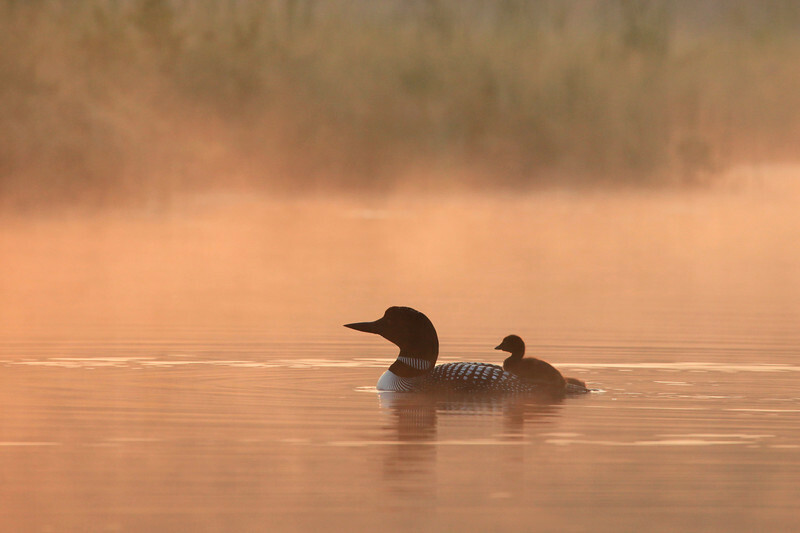 "Loon with baby in morning fog"